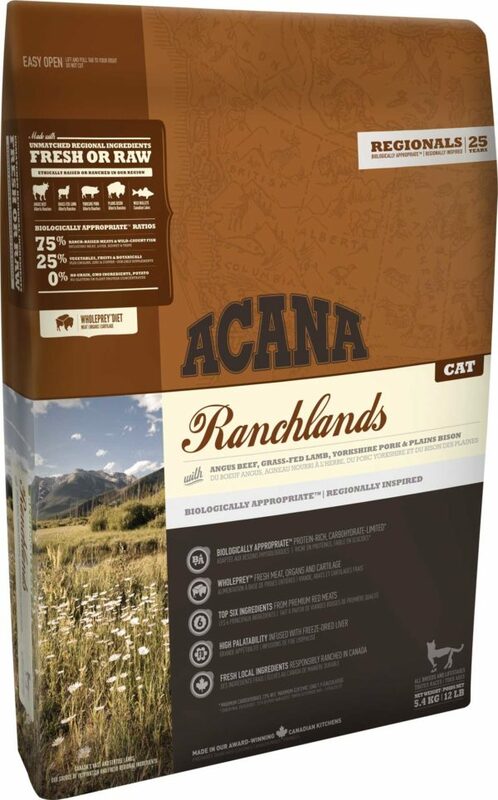 Loaded with fresh Angus beef, grass-fed lamb, Yorkshire pork, plains bison and wild whole walleye, all delivered in WholePrey ratios, ACANA Ranchlands is brimming with goodness and taste. Fresh angus beef (8%), raw grass-fed lamb (8%), fresh yorkshire pork (8%), beef meat meal (8%), lamb meat meal (7%), pork meat meal (7%), whole green peas, whole red lentils, whole chickpeas, beef fat (6%), fresh beef liver (5%), fresh pork liver (4%), fresh bison (4%), fresh wild-caught walleye (4%), whole green lentils, whole pinto beans, whole yellow peas, pollock oil (2%), fresh beef kidney (2%) sun-cured alfalfa, dried beef cartilage (1%), raw lamb tripe (1%), dried brown kelp, fresh pumpkin, fresh butternut squash, fresh parsnips, fresh green kale, fresh spinach, fresh mustard greens, fresh turnip greens, fresh carrots, fresh red delicious apples, fresh bartlett pears, freeze-dried liver (beef, lamb, pork) (0.1%), fresh cranberries, fresh blueberries, chicory root, turmeric root, milk thistle, burdock root, lavender, marshmallow root, rosehips, enterococcus faecium. SUPPLEMENTS: Choline chloride, Zinc chelate, Copper chelate. *Preserved with tocopherols, a tocopherol rich extract of natural origin – Vitamin E and Rosemary Oil.